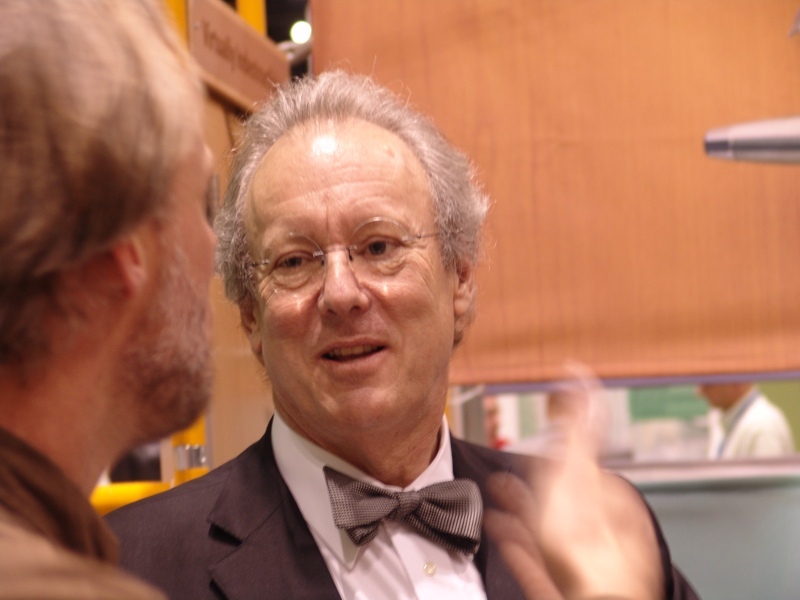 Green architect and co-author of the pivotal green design handbook <a href="http://www.mcdonough.com/cradle_to_cradle.htm">Cradle to Cradle</a>, <a href="http://www.mcdonough.com/full.htm">William McDonough</a> is one of the founders of the <a href="http://en.wikipedia.org/wiki/Sustainable_design">green design movement</a> and one of the preeminent thought-leaders of our time. 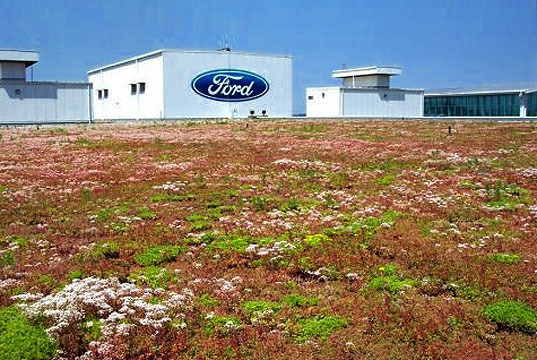 His approach to sustainable design spans the entire industry - from large-scale projects (like designing the largest and most ambitious<a href="http://www.greenroofs.org/index.php/grhccommittees/290?task=view"> green roof</a> in the world) to developing the most rigorous green product standard available. 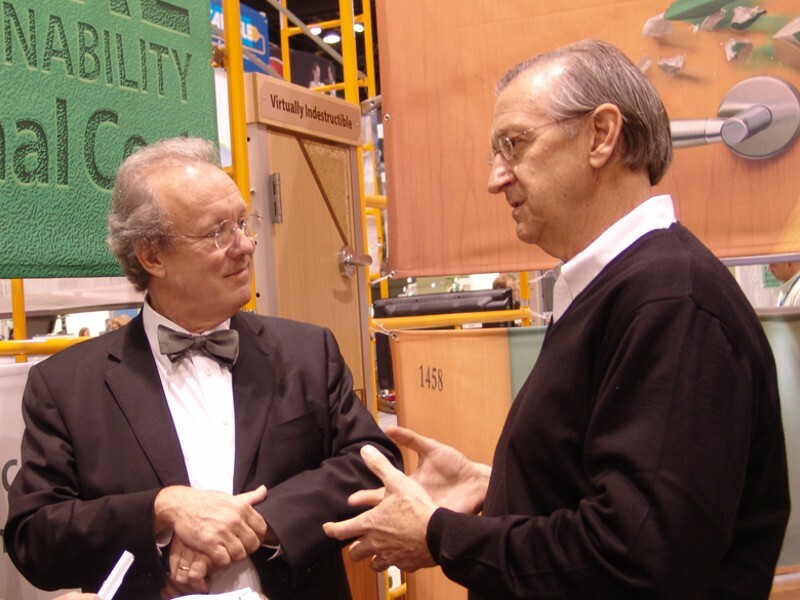 We recently had the opportunity to speak with Bill at the <a href="https://www.inhabitat.com/index.php?s=greenbuild">GreenBuild Conference</a> about his work and the future of green design. We were joined by Howard Williams, VP of <a href="http://www.c-sgroup.com/">Construction Specialties</a>, a leading proponent of safe materials in products, who introduced the company's latest <a href="http://www.mbdc.com/default.aspx">Cradle to Cradle-certified </a><a href="http://www.c-sgroup.com/acrovyn/handrails">products</a>. The thought-provoking and energetic <a href="https://www.inhabitat.com/wp-content/plugins/falbum/wp/album.php?album=72157625426631324">conversation</a> gave us a taste of how intimately intertwined design is with a product’s real-world impact - read on for our exclusive interview! 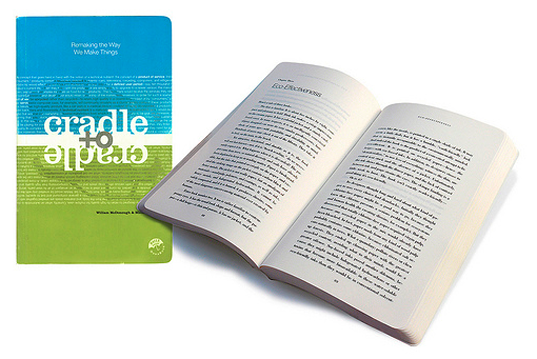 <h3>INHABITAT: What inspired you to write '<a href="http://www.mcdonough.com/cradle_to_cradle.htm">Cradle to Cradle</a>' (the book) and launch the <a href="http://www.mbdc.com/default.aspx">Cradle to Cradle</a> system?</h3> <big><strong>William McDonough:</strong></big> From an early age, I was fascinated by differing attitudes towards resources. Growing up in Japan and Hong Kong, I was given my first look at complete material cycles, where waste becomes food, and resources like water are limited and precious. This contrasted greatly with the wastefulness I witnessed when my family moved to the United States, and that difference in attitude left a great impression on me. As a young architect, my thinking continued to evolve. 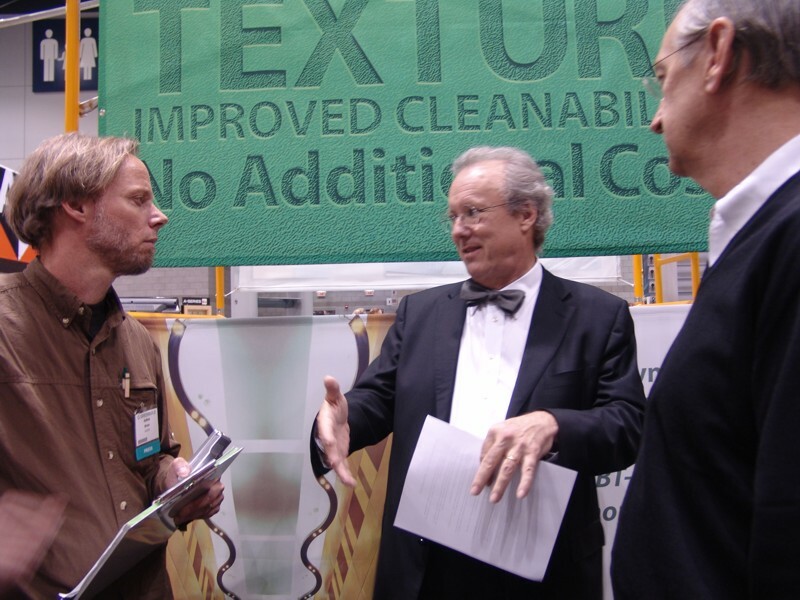 I incorporated elements like solar energy into my designs and began to look closely at the sourcing of materials, but Cradle to Cradle really came to fruition when I met Dr. Michael Braungart. Together we developed the Cradle to Cradle philosophy, which we articulated in C<a href="http://www.amazon.com/Cradle-Remaking-Way-Make-Things/dp/0865475873">radle to Cradle: Remaking the Way We Make Things</a>, which came out in 2002. <h3>INHABITAT: Can you explain how the Cradle to Cradle rating system works - both from the perspective of manufacturers and consumers?</h3> <big><strong>William McDonough:</strong></big> <a href="http://www.mbdc.com/">C</a><a href="http://www.mbdc.com/">radle to Cradle products Certification</a> goes beyond the definition of a rating system or a binary pass/fail seal of approval. Cradle to Cradle is a process for managing the total quality of a product and an engine for business innovation, taking into consideration not only environmental impact but also safety, health and social responsibility. The certification is a continuous and rigorous process, and participating companies hope to move their Basic products toward the achievement of Gold, Silver or Platinum. No single company product has yet achieved Platinum. 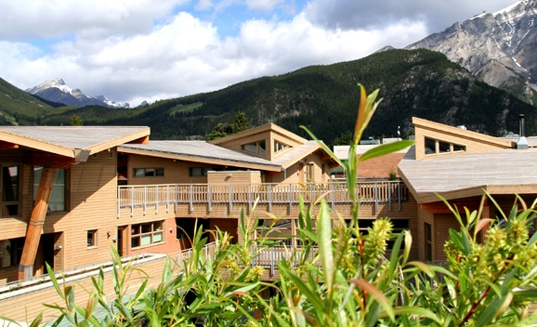 <a href="http://www.mbdc.com/detail.aspx?linkid=2&sublink=8">Certification </a>takes into account five dimensions: materials as nutrients for safe continuous cycling; development of systems to safely close the loop on our biological and technical nutrients; power all operations with 100% renewable energy; regard water as a precious resource; and finally respect for all people and natural systems. <h3>INHABITAT: I was just talking with Paul Murray at Herman Miller about your contribution to their products and it was really extraordinary how closely related their company’s success is with your input. Was this the first company that you’ve worked with on such an intimate level? 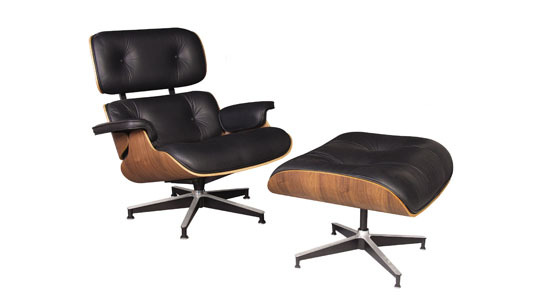 What helped shift the ethos of the company's design culture?</h3> <strong><big>William McDonough:</big></strong> We began to work with them when they stopped producing the Eames chairs out of rosewood - an endangered species. Ultimately, you really don’t want to mess with the icon of a company, but <a href="https://inhabitat.com/herman-miller-yves-behar-unveil-new-eco-sayl-chair/">Herman Miller </a>had a person working there who was so passionate about these issues that the company as a whole went ahead and changed the specs to walnut and stopped using endangered wood. It was a really nice thing for them to do. But really what we’re dealing with here is product quality, and as a result a lot of these attributes you see highlighted by companies are various components that are focused on issues such as carbon reduction, and the like – single attributes. You also see a lot of claims to efficiency, which follows the train of thought “we’re less bad because we’ve reduced our badness by 20 percent.” We don’t want to be selling what we’re not. See, if I look at this sign with the word <em>NO</em> you realize that you’re selling what you’re not. <h3>INHABITAT: In your book<a href="http://www.amazon.com/Cradle-Remaking-Way-Make-Things/dp/0865475873"> Cradle to Cradle</a>, you make the point that when we recycled paper - we are giving up the original quality of the paper - we are losing something. Is most recycling just 'downcycling'? 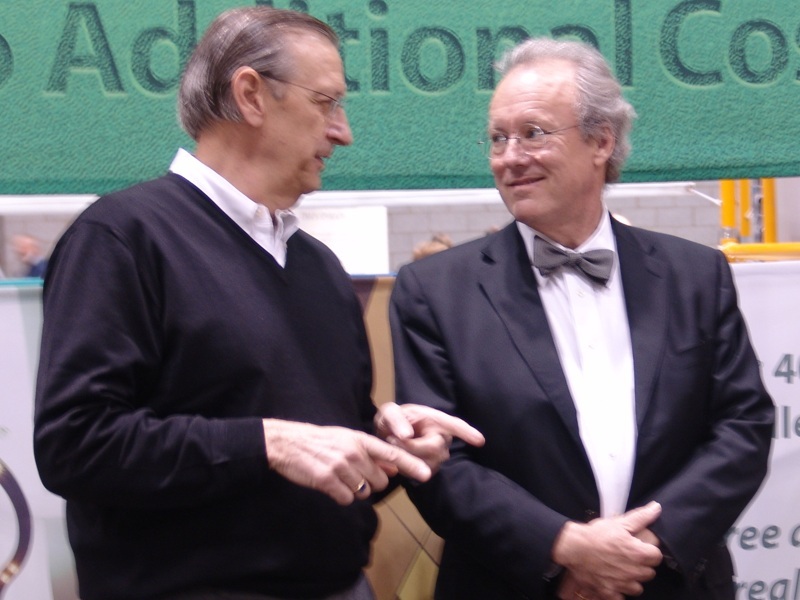 Do we lose quality with every cycle of recycle?</h3> <big><strong>William McDonough:</strong></big> Right, what we want again is product quality, and so with a company like Herman Miller there is an issue of quality. 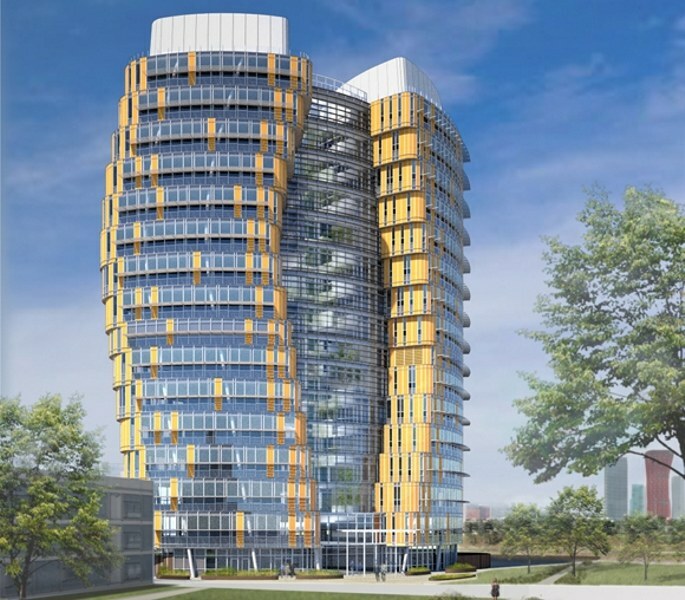 It’s similar to what we are seeing with <a href="http://www.c-sgroup.com/">Construction Specialties</a> here at GreenBuild - it’s about quality products in a fine system. From the market’s perspective you have to start to say things like this because they highlight that there are things to worry about, and that there are people who are genuinely interested and concerned about these things. In <a href="http://www.amazon.com/Cradle-Remaking-Way-Make-Things/dp/0865475873">Cradle to Cradle</a> we addressed something that people may not understand when we proposed a form of producer responsibility over their product. The things we don’t talk about is a "life cycle", so we don’t think that this material is alive. It’s not. We don’t see it as a consumer product because they can’t consume it. I can't consume a TV, so we would call that a nutrient. We don’t talk about <em>life cycle</em>, we talk about <em>use periods</em>. We don’t talk about <em>take back</em>, we talk about <em>reverse </em><em>logistics</em> or <em>intelligent materials pooling</em>. If something was removed from a building right, under our protocols, this is a safe thing to remove. That’s stainless steel, and that’s this, and that’s that, and they are defined. So then you go back into a materials pool. <big><strong>William McDonough:</strong></big> It’s like a Herman Miller chair that ends up in Mexico City fifteen years from now, if somebody throws it out the back and into the dumpster. Well, the scavengers will just come and grab it. It’s worth something. The reason it’s worth something is that’s steel, and that’s aluminum, and that’s polycarbonates, and that polyethylenes. It's no longer a chair, it’s part of the materials intelligent pool. So the design is that aluminum can come off and go back to aluminum, the steel goes back to steel. They're not monstrous hybrids that can’t be separated. <h3>INHABITAT: In your work you talk about recycling, which I think a lot of people - including myself - have been confused about, particularly as it compares to <em>upcycling</em>. 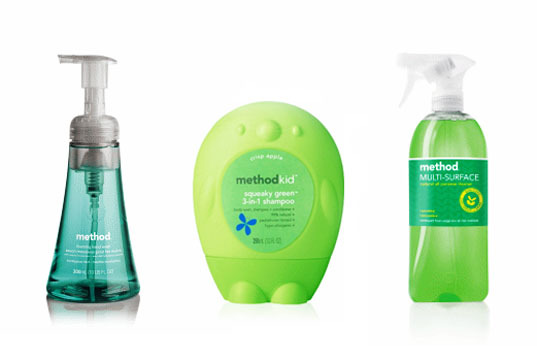 Looking towards the industry, a lot of products have recycled content, and with the way that recycling is “marketed” so to speak, many people still think 100 percent recycled has got to be the best you can get. What is the distinction between recycling and upcycling?</h3> <big><strong>William McDonough:</strong></big> We coined the term “<a href="http://www.sustainabilitydictionary.com/u/upcycle.php">upcycling</a>”, and a good example of this concept would be polyester. You can take a polyester water bottle made at food grade, and the fact is that polyester is probably the highest quality of polyester in the world, right there in that bottle. The bottle will have some contaminants from the catalytic process, which leaves a bit of antimony-- that’s not a good thing because it is a catalyst. But putting the contaminants aside, the bottle is a spectacular piece of human-engineered material. If we recycle that polyester into a fleece jacket, there are people who would say “Oh, you’ve upcycled it from a lonely water bottle into a hybrid fleece jacket.” There are people who would say it’s being upcycled into a jacket, but from a technical perspective that would be downcycling. It would be de-fibered. Chemically it’s way downcycled. That stuff is really contaminated with all sorts of nonsense. So you need to upcycle the PET bottle, but you've downcycled it. See, the problem? Contaminated fibers that are on their way to a landfill or maybe whole fibers. That’s not going back to bottles, which is high-end use. So upcycling a PET bottle would be taking that PET bottle and putting it back through recycling as PET and removing the antimony. That’s upcycling. <h3>INHABITAT: <a href="http://www.c-sgroup.com/">Construction Specialties</a> recently achieved Cradle to Cradle Gold certification due in part to the elimination of PVC and PBTs in their interior wall products - can we talk a little bit about the dangers of PVC’s and PTB’s?</h3> <h3><strong>Howard Willams: </strong><span style="font-weight: normal;font-size: 13px">The interesting thing is that within the<a href="http://www.usgbc.org/"> USGBC</a> there was a furor over giving a negative credit for using it - if anyone uses PVC, they should lose a couple of points in <a href="http://www.usgbc.org/DisplayPage.aspx?CategoryID=19">LEED</a>. As the debate went on, I wrote two letters to the USGBC saying that they either need to have negative credits or that they need to take a clear stand on PVC.</span></h3> I think there will be a decision, because PVC raises just one issue, but there is the greater picture of persistent bio-cumulatives in toxins. If they had stopped at PVC, they would have stopped short - absolutely short. There needs to be an awareness created that PVCs exist in building materials, and that they can be taken out. And they should be taken out, not only for building and the people in the building, but also for the people who make the stuff. Because with just a piece of PVC pipe, I can handle that all day long - it’s rigid, there is very little going to be coming off of that pipe and it’s not going to off-gas, but if I trace that back into the community where the vinyl chloride is made a whole other set of issues arise. This involves the people that are working in that factory and the people that are living adjacent to that factory. To me this is also a stewardship issue, but the great part is that it reaches beyond construction - it touches on health care, education and wanting to make a building healthy. Right now it is a differentiator for us. The beauty too is there is is a business model for it. It works, you can do this and you can make money. There is not one environmentalist or NGO that I’ve yet encountered that says you shouldn't be making your money off of this. They want money to be made on this, because they know that it is going to accelerate the change. <h3>INHABITAT: Where do you see <a href="http://www.mbdc.com/default.aspx">Cradle to Cradle </a>headed? Ten years ago Herman Miller started developing their entire line as a Cradle to Cradle concept, and now they’re selling some of the best chairs in the world at fair price points. Ten years from now, how many of these booths do you see using this vernacular as a standard?</h3> <big><strong>William McDonough:</strong></big> I think you would be quite surprised. We’re just at the beginning of something, even though we’ve been at it a long time, and it’s taken us a long time. We've integrated all of the different ideas that we’ve come up with and made it understandable in a robust and usable database. Ultimately we have positioned<a href="http://www.mbdc.com/default.aspx"> Cradle to Cradle</a> for the public good through a not-for-profit institute. We’ll have it be reviewed by scientists and we’ll have Cradle to Cradle conferences every year for the institutes we expect to spring up all over the world. I recently signed a MOU or Memorandum of Understanding with the Israeli Standards Institute, and they are looking at <a href="http://www.mbdc.com/default.aspx">Cradle to Cradle </a>as a standard for Israel. So if you want to sell something in Israel, you’ll want to be Cradle to Cradle certified. <big><strong>Howard Williams: </strong></big>Ten years from now, this may still be GreenBuild because it’s going to be the original name, but no one is going to be talking about green. The reality is that it’s going to be either <a href="http://www.mcdonoughpartners.com/design_approach/process">good design</a> or bad design. It’s not going to be green. Bad design will be broader than the visual, it’s going to be more than “It broke three weeks after I bought it.” <big><strong>William McDonough:</strong></big> You know that’s a good way to put it because we see design as the first signal of intention. We have realized that we’re just designing from the top of the pyramid. If we want to <a href="http://www.mcdonoughpartners.com/design_approach/philosophy">design for everybody</a>, we’ve got to be cost-effective and all of that. We can’t just single out attributes and certifications so that you're not off gassing -- while you've got a green stamp for all you know it could be all cancer. I mean what is that? It’s not okay -- it’s not green, you're still black. You know, you haven’t changed anything. All you have done is stir it up. <h3>INHABITAT: Is it true that sustainability not an adequate word? Are we looking for that next terminology or is sustainability still viable?</h3> <big><strong>William McDonough:</strong></big> Sure, I think it’s a nice word because so many people can use it. But, nobody knows how to define it. That’s part of the issue, and that’s why we never use it. But, from our perspective, we’re not putting it down, we’re just saying it’s insufficient. For example, if I say what’s your relationship to your wife? Do you say just say sustainable? Don’t you want more than that? Don’t you want creativity and fun and all these things? If we just sustain what we are doing now, then we’re all dead. This is carbon based silliness, a lot of this stuff, I mean we can’t sustain it. Even if you reduce your carbon, we’re still in trouble. We don’t have an <a href="https://www.inhabitat.com/energy">energy</a> problem - what a lot of people don’t realize is that we have a materials problem. The carbon in the air is in the wrong place, it belongs in the soil. You need a defined system and sustainability is not that. <h3>INHABITAT: In the Book <a href="http://www.amazon.com/Cradle-Remaking-Way-Make-Things/dp/0865475873">Cradle to Cradle</a> you mentioned ever so briefly the concept of delight, celebration and fun -- can you talk a little bit about the quality designs, the delight of design, and how people engage with a product through design?</h3> <big><strong>William McDonough:</strong></big> I really think the thing that I find most exciting for me as a designer is that once you get away from all the meat and potatoes stuff of safety, health and whatever – there is the creative side. For example, I’m designing <a href="http://www.mcdonoughpartners.com/projects/view/ferrer_research_development_center">a building in Barcelona</a>, it’s a laboratory tower, and we are working on materials. We’ve got the paint and the tiles made with the right stuff, but there are these two triangular floorplates that are laboratories for pharmaceuticals. It has a 15 story glass atrium that the scientists walk through. They're afforded a view of Barcelona - at the north side are all these plants growing on it, and at the south side it is all shading. The floor plan is in big triangles, and I came back from a trip and people in my office are saying, “Bill, I have trouble laying out all the tile with the walls because they’re radial and the outside is curved. You have to cut every tile to get these patterns. They won’t line up.” In response I say “Look, let’s save some money and have some fun.” I proposed taking the floor plan and starting with the tiles, just tiling the whole floor, then putting the walls up. That way you can remove the walls and you afford yourself the ability to change the building into apartments. 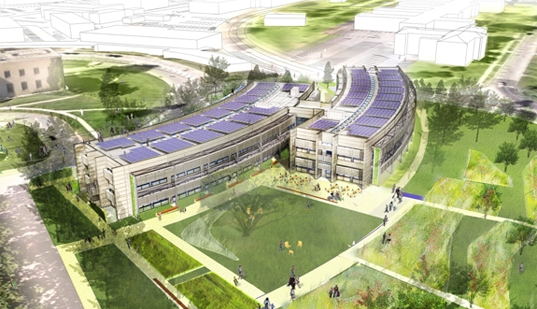 <big><strong>William McDonough:</strong></big> My people are really magical. I said, "I want you to go find me the endangered butterflies of Catalonia, and I want them rendered as tile patterns on the floor so each of the floors is a wing of a butterfly from ancient Catalonia that’s endangered." We then looked at all of the different colors of the butterfly wings - they’re so beautiful - then we picked the ones that we could create using ecologically safe clay colors made locally. Then we picked all the colors that weren't safe – the toxic ones – and worked with the tile company to get into a program of changing all of those tiles into safe tiles. You get this generative thing that starts with the idea of a butterfly. All of the sudden you’re worrying about green and yellow tiles being safe and the company goes, "Wow, yeah that’s more beautiful -that’s more fun." So they’re going off to improve their product. In the meantime we’re taking the ones we can use that match certain butterflies. Those are the wings we are using, and we see the floor plan with all butterfly wings. They’re so gorgeous. You can’t believe it. <h3>INHABITAT: And it resulted from a problem, which is interesting.</h3> <big><strong>William McDonough:</strong></big> A problem which you were solving in a delightfully cheap way. But here is the magical part - I then decided with the client, that we'd take the 15-story atrium - where we were looking for planting ideas and how to make it nice - it’s going to be a butterfly habitat. Now we’re making a deal with the zoo that this is where we’ll hatch the chrysalis of the butterflies and we’re going to load the whole atrium with butterflies hatching. <big><strong>William McDonough:</strong></big> Every week on a Saturday we'll open up the doors downstairs, the children of Barcelona will come, we’ll open the top of the atrium and we will send thousands of butterflies into the Barcelona environment. 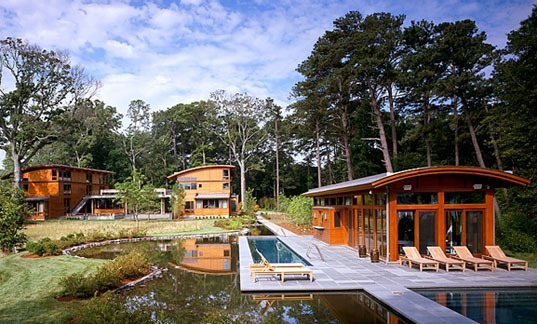 So you’re pumping biodiversity back into the environment by design, and now that’s delight. 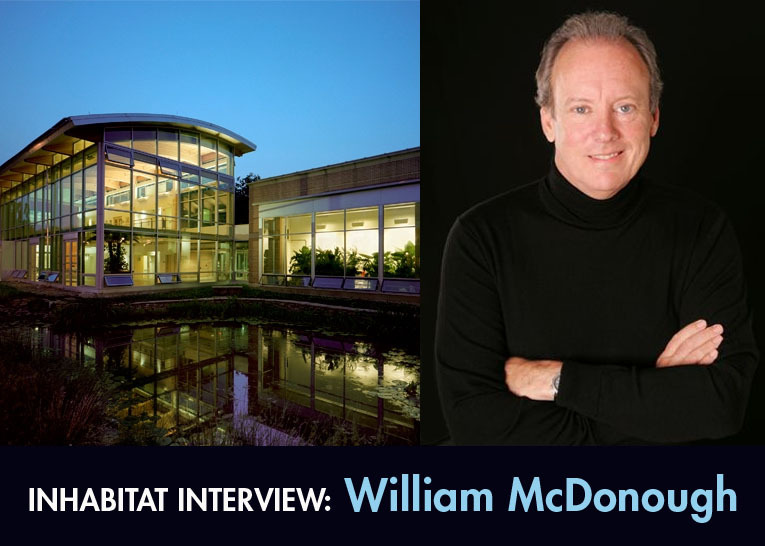 Green architect and co-author of the pivotal green design handbook Cradle to Cradle, William McDonough is one of the founders of the green design movement and one of the preeminent thought-leaders of our time. His approach to sustainable design spans the entire industry - from large-scale projects (like designing the largest and most ambitious green roof in the world) to developing the most rigorous green product standard available. 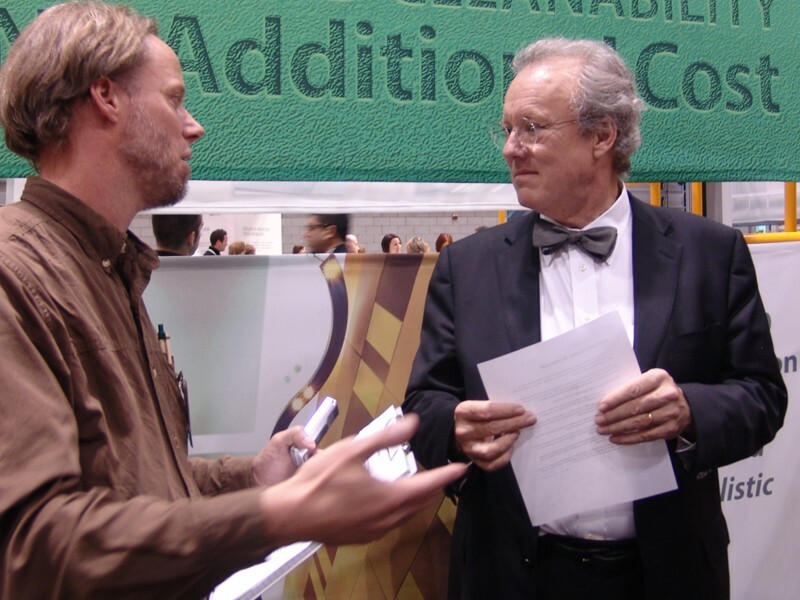 We recently had the opportunity to speak with Bill at the GreenBuild Conference about his work and the future of green design. We were joined by Howard Williams, VP of Construction Specialties, a leading proponent of safe materials in products, who introduced the company's latest Cradle to Cradle-certified products. The thought-provoking and energetic conversation gave us a taste of how intimately intertwined design is with a product’s real-world impact - read on for our exclusive interview!